Migration calculated from samples in the YFull tree 12-10-2018. I2 is believed to have survived the ice age in a European refugium before moving back to previously inhabited areas. Link to most up-to-date migration. The diversity below S2639 in the British Isles is so great that it appears valid to conclude that this man spent most or all of his life there about 7000 years ago. This predates the introduction of agriculture into the region by about 1000 years. This affirms the commonly accepted view that I2 was associated with hunter-gatherers in Europe. "Archaeologist and prehistorian Caroline Malone noted that during the Late Mesolithic, the British Isles were something of a "technological backwater" in European terms, still living as a hunter-gatherer society whilst most of southern Europe had already taken up agriculture and sedentary living." Interestingly, the introduction of S2639 into England (or at least its diversification there) happened roughly 1000 years after flooding separated England from continental Europe - possibly caused by a tsunami from Norway. 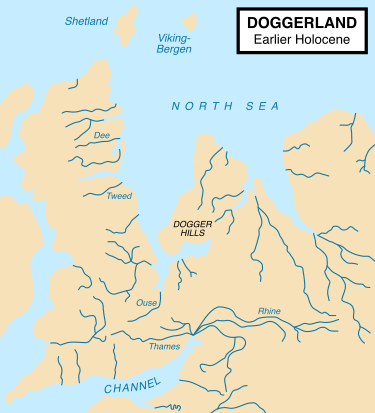 The landmass known as Doggerland had previously connected England to the Netherlands and western coasts of Germany. Perhaps the aftermath of the flooding on coastal populations wiped out the other siblings or cousins of S2369, resulting in a 3000 year bottleneck from 10,000 ybp to 7000 ybp. S2639 is currently under sampled in Germany and France do to the oversampling of Western English speakers. By the English-speaking genetic companies. France even has a law against casual DNA testing since 1994. As I am paternally French via Quebec into NY, i, with many French Canadian males, are much of the data for French-origin y-DNA. 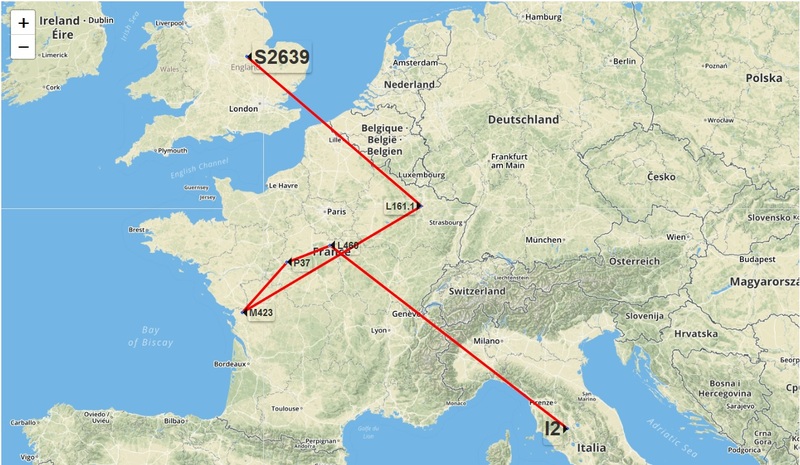 My paternal line is recorded back to Continvoir, France to at least 1649. Here, I match a man surnamed Croix, whose ancestors were from Luynes (20 minutes from Continvoir by car). Our paternal ancestor predates common surname use linking our diversion to 1000-1500 AD. I closely match three males in Great Britain, we are connected in ancestor I-A8742. One from Wales, one from Scotland, one from northern Ireland. I was initially thought to be a fluke as the “isles” flag was briskly planted for subclade l161 and descended. I took three of my close British matches and traced them to surnames originating with the Norman Conquest of 1066. Wauke/Walkup, Redemand/Redmond & Collier we’re all slept into Britain during the conquest and subsequent land divisions. By the time of the crusades, these titles expanded into Scotland, Wales and even northern Ireland. I tested a few more lines to Norman settlers and figure most if not all l161 (and most I2a in Britain) are the result of the Norman migration of 1066. This is also the best hypothesis on how Croix & I would be so closely related to these Brits. Samples that were given arbitrary ages in Britain, prior to modern genome research, are causing research obstacles. There is no calibration with y-DNA distribution and known historical records. Modern I-2A carriers are most densely from historic Gothic settlements. The Gothic (Visigoth/Salian & Ripurian Frank/Ostrogoth/Burgundian/Alamani/Marcomani) migrations carried I2a into Europe proper from c. 200 AD onward. Prior to this, they were long inhabitants of the Black & Caspian Seas region. All Goths are recorded as migrating in from the Dalmatia/Pannonia provinces, which is were one of I-2a’s most dense branches exist today, the “Dinaric” branch. The other hotbed, Sardinia, was sacked by vandals, taken and settled by Visigoths and later even the Franks had a campaign there. There is a chance that some Gothic-type mercenaries went in with the Anglo-saxon wave, but was the Goths we’re the reseason for the i2b Teutons to push westward, it’s rare at best. All this to say, as more French test, the weight of I-2a subclades in Britain should shift back to mainland Europe. I can say, with the three documented British Norman males that match me, with what I know about Croix & My origin, my paternal line would match up with them around 200-1000 AD around the Loire River.